Well, what a kick it was to find out that writer Matthew Mayo lives practically around the corner from me. 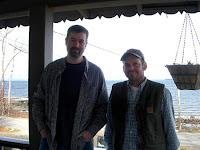 The Charmer and I were invited to stop by, which we did, and we spent a couple of enjoyable hours shooting the breeze about all kinds of stuff like Shane, favorite crime writers and Gunsmoke vs. Bonanza. In Matt's words "we prattled on like a couple of Jane Austen characters." So true. And Matt was incredibly gracious when I became especially exuberant over The Six Million Dollar Man's duel with the Sasquatch. Matt's latest is COWBOYS, MOUNTAIN MEN & GRIZZLY BEARS: Fifty of the Grittiest Moments in the History of the Wild West. I have to confess, it contains many stories about real-life characters new to me, such as John Colter, George Drouillard and Marie Dorian. But even the well-worn tales—Tom Horn, Wyatt Earp—are fresh thanks to this Spur Award finalist's sharp prose. Whole-heartedly endorsed. Oh, and I have to brag... I got a personally signed copy. Review of COWBOYS by Laurie Powers. Gotta say that's my kind of conversation. Dave, my kind of book, thank you for the tip. You, Richard Prosch, and Laurie Powers might want to consider becoming literary agents! I appreciate all the coverage and kind words you've offered me. Our visit was grand--even if your poor wife had to listen to us talk and talk and talk about ... cool stuff. She deserves a medal. Or a fine meal out. Your treat. And she swears she wasn't bored. I'll become a literary agent...where do I sign up?? Great title and one I'm really interested in. A couple of Jane Austen characters?? Really? That's pretty awesome. I like the sound of that book. Not my typical fare, but it sounds riveting. Alyssa, If you enjoy reading history that springs to life from the page, then this is for you. I do really want to read a few westerns, so will check these links etc out. Thanks David. How much fun to discover a fellow writer in your neighborhood! I’m lucky to have 3 YA/MG author friends who live in my small town, two on my street. I like your Jane Austen reference – so true! My grandfather’s cousin used to host literary salons in her home in Cambridge MA. Wonderful, when thigs work out that way!